The clock at Twickenham is running past 80 in the match between England and South Africa with England leading 12-11. The South Africans are in their 15th phase when a poor pass from Embrose Papier bounces along behind the backs on the left. Centre André Esterhuizen collects the ball and keeps running across field, slightly forward. He is approaching the England 10-metre line when Owen Farrell of England stops his run. The ball comes loose, England kicks it out and the referee blows the final whistle. 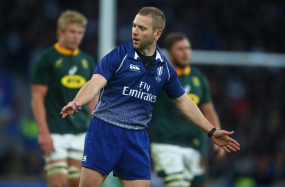 The referee had received a "check-check" from the TMO and consults him. There are replays showing what happened - that Farrell turned side on and the hard knob of the right shoulder made strong contact with Esterhuizen's upper chest. The referee makes his decision, saying: "There is enough of a wrap on the far side." And so he does not penalise Farrell and the match ends. This decision has angered South African supporters. Let's go to law and reason for the law. Law 9.16 A player must not charge or knock down an opponent carrying the ball without attempting to grasp that player. Farrell charged and knocked down the opponent, and it was the head of the humerus that made hard contact with Esterhuizen. Farrell's right arm made no attempt to grasp Esterhuizen. Farrell's left arm dories move forward. That is "on the far side" that the referee is referring to. Test yourself. Push the knob of your right shoulder forward and see what a weapon you have. Do it again and this time lift your right arm, and you see how that knob falls back and is no longer a hard weapon. Push your right shoulder forward again and lift your left arm forward as high as you like and notice that the knob of the right shoulder does not retreat. It remains a weapon. In insisting that the player attempt to grasp the opponent is simply to depower the knob of the shoulder, the "sharp shoulder". It did not happen in this case. It would seem that there was a strong case for a penalty. It would probably have been penalised if it had happened 20 minutes earlier but it seems a rule - unwritten, of course - that referees should not penalise in the dying minutes of a match but leave the players up to decide the final score. That is not right. The laws apply through the duration of a match. The penalty would have been about 15 metres in from touch and 42 metres from the England goal-line. It was a much harder kick than the conversion and the penalty in front of the posts that South Africa had missed. Kicking out for a line-out would have been far too great a risk as earlier wayward five-metre line-outs had shown. There is no point in blaming the referee for "costing" the Springboks the match. He had not overthrown line-outs, missed kicks at goal, gone offside or even knocked on. They did that all by themselves. By the way, understanding why a law exists is helpful.